Last month I talked about the option to Drop or Ignore Criticism instead of holding on to it. As I was working through this myself, I began using Carlo Walth’s Humbling Guide, a beautiful spiral booklet which includes updated text from Andrew Murray’s book, Humility as well as great works of art. (The guide also has space for journaling, small group activities and formation practices. 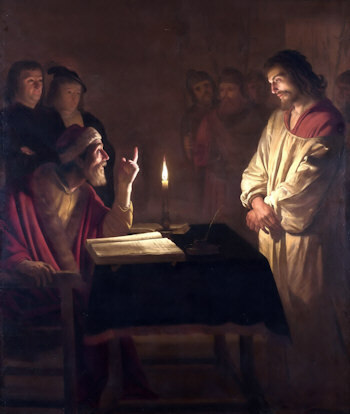 www.MentoringSacredArts.com) When I came to this reproduction below “Christ Before the High Priest” (Gerrit Van Honthorst, 1617), I became overwhelmed with wondering what Christ was thinking. Immediately I assumed that Jesus must be thinking whatever I would think. (We all do this, and it is a place to start in meditating on gospel scenes.) What would I think? How terrible to have these untrue things said about me! Why is this person so angry? So mean? So I would have been terribly hurt and angry at these false accusations. Then I pondered how Jesus might be standing there dreading what was to come. We dread certain medical procedures – but this would be torture. He had to know that. But the expression on Jesus’ face in this painting is so intentional. He was choosing what to think. He doesn’t seem trapped by circumstances. Even though his hands are tied, they seem to be at rest in front of him. No big deal? What would Jesus really have been thinking? I began almost screaming in my mind. Because I was using Carlo’s guide, my mind wandered back to an earlier page of it on which Carlo had grouped certain quotes of Jesus. Here are a few: “The Son can doing nothing by Himself”; “I do not receive praise from men”; “I have not come to do My own will”; “I do nothing on My own” “I do not seek glory for Myself” (John 5:19, 41; 6:38; 8:28, 50). This kind of thinking was a key to Jesus’ humility: partnership with God, oneness with God, relying on God for everything. I’m guessing Jesus was not preoccupied with himself and his circumstances, but with God and with God was doing in the world. Maybe, just maybe, Jesus was relying completely on God, not on his own strength. Gazing at this painting, I saw how to be in the moment of actual criticism. I don’t have to be devastated or even hurt. I can stand in the reality that I have oneness with and depend entirely upon Jesus who is now at work in the universe. (See Dallas Willard quote in last month’s wisbit.) The Spirit really can do the “heavy lifting” in my life. I do not have to live “on my own” anymore.